If it were up to the younger Matt Haarms, he would have stayed in his room reading. Little did he know then, as an 11-year old in the vibrant Dutch city of Amsterdam, that he would fall in love — with basketball, and play in the middle of the United States at Purdue. His mother, Martine van Hoorn, had other ideas. She signed him up for judo. If he went outside for a bit, he would play soccer with his dad Peter Haarms, but even then he was the goalie. But then he got wind of basketball. He gave it a go, and he was hooked. Practice was twice a week, but Haarms wanted to do more. He couldn’t stay after to practice on Tuesdays and Thursdays because the club doubled as indoor soccer and handball, so he came up with another solution. Last year’s 6th man, this year’s starter? Trust me, if you’ve ever been to Amsterdam, one of the best cities in Europe, if not on the globe, you would really have to search for outdoor courts. So, Haarms isn’t spinning a tale here. He really had to make an extra effort if he wanted to improve his game. But Haarms' story also shows how playing a sport at a young age doesn’t necessarily mean a kid will grow into being a Division I athlete. Haarms, who was blessed with a 7-3, 250 pound frame, didn’t peak too early and wasn’t a player who was destined for the role he will take on his sophomore season — a Purdue starter. Haarms, now 21, played club basketball in Amsterdam, then went to Barcelona for his senior year with the idea that this was something to ride toward a college education. The level of coaching was better than he had hoped. Haarms wasn’t ready for Division I out of his stint in Barcelona so he went to the U.S., arriving in of all places, Wichita, Kansas at Sunrise Christian Academy for a postgraduate year. No offense to Wichita here, but going from internationally beloved cities Amsterdam and Barcelona to Wichita is a path not normally taken. And yet, it was exactly what Haarms needed and ultimately wanted. Haarms could lock in and actually focus on the sport with no distractions. Offers weren’t plentiful for Haarms until he played AAU basketball with the Chauncey Billups AAU Elite team out of Denver. He eventually took a visit to Washington State, but he knew immediately he was right for Purdue when he went to West Lafayette. If you haven’t noticed, Haarms’ command of the English language is far better than most. His mother started teaching him early before he began classes in Amsterdam at 12. When he left Wichita for Purdue, he said he was told at the airport that he sounded like he was born around the area. Haarms is a quick study. And that’s why he should be a difference maker for the Boilermakers this season. Haarms was thrust into the spotlight in the NCAA tournament last season, starting against Butler and Texas Tech after Isaac Haas injuried his elbow. Haas, who was Haarms’ roommate during the tournament, worked with him to be ready. Haarms had a combined 11 points and nine rebounds in the two games. Those two games were the prep he needed to jump start the offseason. Haarms will be counted on to be the anchor inside to Carsen Edwards’ scoring prowess on the perimeter. He has already been the mentor to freshmen Emmanuel Dowuona and Trevion Williams. There are other newcomers like Sasha Stefanovic and Aaron Wheeler too, whom Haarms said have bought into the winning Purdue culture. 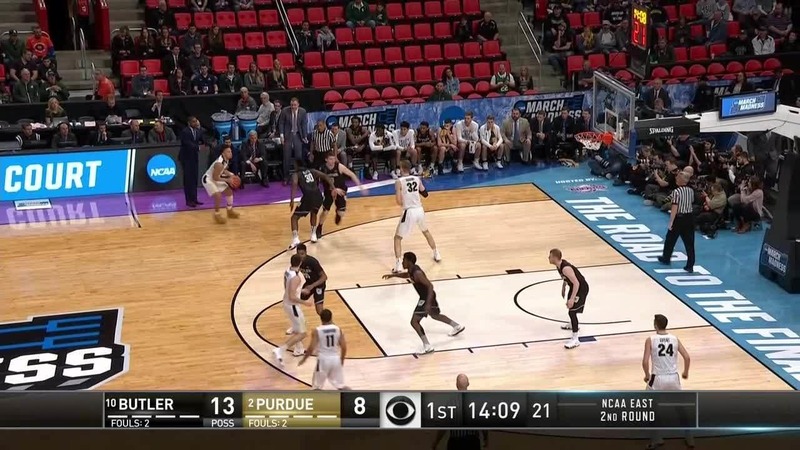 And while Haarms said his shot blocking (79 as a freshman, the second most by a freshman at Purdue and seventh most by any player in school history) comes naturally, he has to improve offensively. He must be more of a target outside of just flushing an alley-oop or a put back. He said he has worked extensively on his shot. But what he didn’t need to tweak over the summer was his raw emotion and energy that he brought off the bench last season. His lanky frame, floppy blonde hair and active arms gave Painter’s team a second gear. Haarms said he’s sometimes too eager to get the block and allowed the tipped block or the altered shot to go to the offensive rebounder for a layup. “It comes naturally, but it’s recognizing when I don’t need to go and when I do,’’ said Haarms of coming over for a block. The enthusiasm for every possession won’t fade, though. The difference will be Haarms will have to bring it from the opening tip, not from the bench.